Everyone is always talking these days about too much big government control of certain industries. But you won’t hear any complaints from the billboard sector. That’s because there are certain advantages of being fully regulated by the Federal Government. Billboards have been that way since the Highway Beautification Act of 1965, when the government laid down controls that included the spacing between signs, maximum height and size, and what zonings they could be built in. And the benefits are enormous. Restricted supply equals high demand and values. No worries about competition ruining your ad rents. Even protections on values if a sign has to be removed. In an age in which other industries complain about too much regulation, the billboard industry just can’t get enough. One of the most profitable signs I’ve ever owned began as an abandoned structure along Highway 75 in Dallas – but it could be along the highway just down from your house. The potential is there in many old signs, and the only thing holding you back from a sign like this is keeping your eyes open and creatively figuring out how to put the deal together. There are many different reasons that some signs become abandoned. A common one is that the landowner wanted a ground rent that was too high when the sign came up for renewal so they walked away from it. Other times, there was an obstruction that blocked visibility of the sign which has since been removed. Still another reason is that the market was weak for advertising at one point in time, and since then the area has become more prosperous. If you keep an eye open for them, you will start seeing abandoned signs all over the place. The key is to bring these signs back to life. That means striking a new deal with the landowner, fixing any structural and wiring issues, renting the ad space, installing the advertisements, and collecting the money. And it’s a win/win as you are taking something that is ugly and depressing and making it pretty again and re-starting the property owner’s income stream. How do you approach the landowner? The sign has been abandoned for years. During that time, the land owner has received nothing for the sign being there. On top of that, it’s not helping the aesthetics of his property at all. So you basically tell the land owner that you want to bring the sign back to life and will pay him $ X per month for letting you do so. It is rare to find a property owner who is not excited about the concept of getting something from nothing and curing an eyesore on his property. You have to understand that what you are often doing falls in a grey area, and make sure that you don’t have a huge investment in the sign as there’s always the risk that you will lose it. The key issues that can pop up and hurt the project are 1) the city or state saying the permit has been invalidated 2) the former sign owner emerging from decades of hiding and demanding their sign back (I’ve never heard of that happening) and 3) finding that the sign is structurally dangerous. You need to only work on abandoned signs that you can get into for small change because of the risk factor. So here’s the kind of deal you can sometimes put together with old, abandoned signs. I came across an old wooden structure that had three ad panels on it. Fully abandoned. But structurally sound. I went to the landowner and he was more than happy to bring it back to life. I researched the permit and it was still in effect. So I rented the ad space and put the ads up. 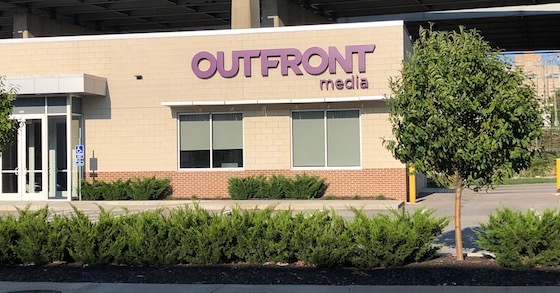 I was able to get $3,000 in total ad rents for the three separate panels, and the sign – after all costs – was netting around $20,000 per year. There is probably no greater investment opportunity than old, abandoned billboards. They are giant money makers if you pick the right ones and use a smart strategy to bring them back to life. No, this photo is not an optical illusion. 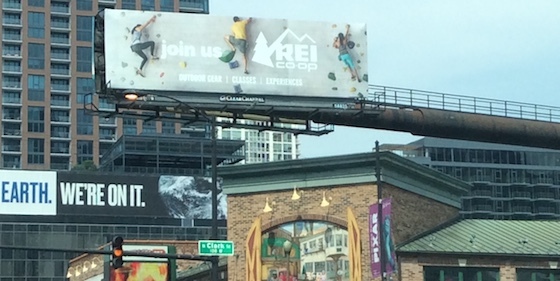 It’s a real billboard on a road in Chicago, Illinois. And it’s a rare type of steel monopole sign structure called a “super flag”. A super flag is one in which there is a massive distance between the top of the column and the start of the ad face. It’s like a full-flag sign on adrenaline. And it’s an amazing thing. Every time I look at a super flag, I’m blown away that they don’t collapse. Think about the forces required to hold a 10,000 pound billboard head up from 100’ away. Think of all the pressure on that column and foundation. It’s kind of like looking at a skyscraper – you can’t figure out how it doesn’t fall down but it just does. I remember the first time I built a small super flag and the crane operator would not let go of it because he was convinced it would collapse the minute he did. People don’t build super flags just for fun. They build them out of necessity. Super flags are the only structures that work in some locations. Here’s an example. You have a busy gas station on a corner and you can’t put the pole anywhere near the pumps or parking. So you put it behind the building and then have the super flag reach all the way out to the street. On top of that, some of these locations are in super busy areas of big cities like Los Angeles, so the potential ad rates are enormous. Big ad rents are the only way to justify building super flags, as they are one of the most expensive structure types in existence. They are also extremely hard to build, as they require giant foundations to hold the pole up, and the access is sometimes very strict – literally in tiny alleys in some cases. A good estimate on these type of signs – based on size and length of the super flag – is $100,000 and up. Super flags are one of the most epic structures in the entire billboard industry. They are a combination of form and function, and have made countless locations possible – many of which are some of the highest grossing ad locations in the U.S. When I first got in the business, I was terrified of not being able to compete with the big companies. But over time I realized that someone starting out can still clobber big operators if they work smart and take advantage of their weaknesses. 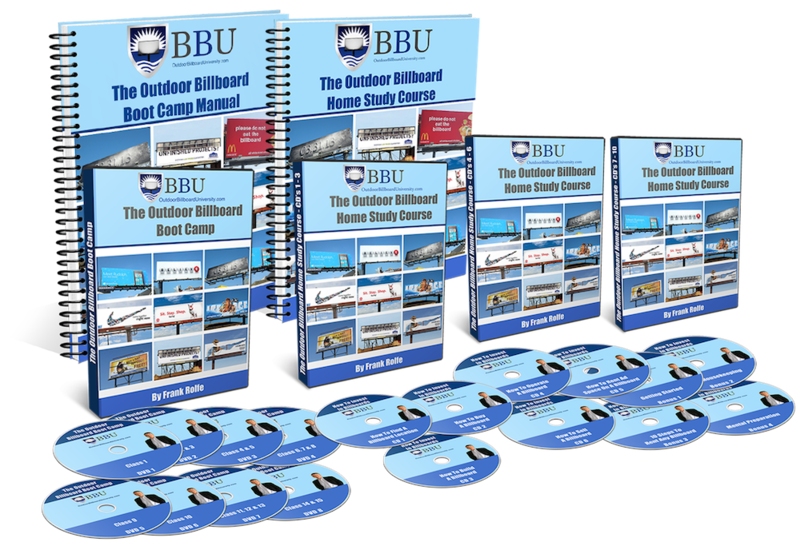 So how can you take on those big billboard companies and win? When you really think about, behind all their fancy buildings and public relations, a giant company is just a bunch of people. And none of those people are any more talented than you are. In fact, you’re a lot more talented than most of those big company players. Why? Because you’re strong enough to start your own company while they just collect a paycheck and live for the weekend. I’ve been around these big company people for decades and they are nothing to be afraid of. One of the largest weaknesses with big companies is speed. Big things just move slowly. They require too many committee meetings and decision makers. As a result, while you’re negotiating and signing up a deal with a property owner, the big company has to get multiple approvals which can take days or weeks. Speed is of the essence in deal making, and big companies are way too slow. Because the people who work at big companies are not owners – and get no financial gain from any transaction – they have much less enthusiasm than you do. In fact, they really don’t care much at all. As a result, you can outwork these big companies with ease. As Warren Buffett once said “without passion you have no energy, and without energy you have nothing”. In a modern America, people are tired of lack of customer service. Whether it’s at Walmart or on the internet, there is a shortage of human contact. People want customer service, and they tend to favor the person that offers it. Big companies have little customer service because they don’t like to customize, only to standardize. That gives you an edge. And beyond that, the average American just plain likes the underdog story – the person who takes on the big company and wins. That’s the story of Steve Jobs and Bill Gates and a thousand other examples. When I got my first billboard lease, I think a big part of it was that the landowner just liked the concept of the small guy beating the big guy. It’s human nature. Never think that you can’t compete with big companies. You definitely can. They have many weaknesses and you have some advantages that you may not have even thought of.